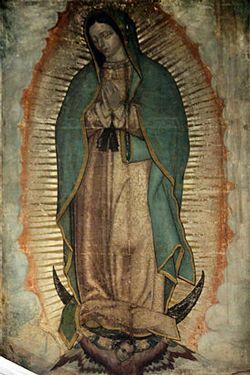 Background: Our Lady of Guadalupe is the name given to the Blessed Virgin Mary following her appearances to Juan Diego in 1531 on a hill near Mexico City. Mary healed his uncle who was near to death and asked Juan to pick some flowers which she arranged and he put inside his cloak. Later, when he opened his cloak in front of the Bishop, the flowers fell to the floor leaving behind her now world-famous self-image. A shrine grew up at the place of the visions and his cloak put on display. Many millions of people visit the site annually making it the most visited Marian shrine in the world. The Miraculous creation of the image of the Our Lady of Guadalupe occurred on 12th December 1531. Maker of heaven and earth”. faithful Marian servant all the days of my life. all their sorrows and their sufferings”. but only if it is for the good of my soul. Our Lady of Guadalupe: Pray for Me.